Earlier this summer, biologists and physicians from all over the country convened in Eugene, Oregon, to discuss the cutting edge of host-microbiome systems research. 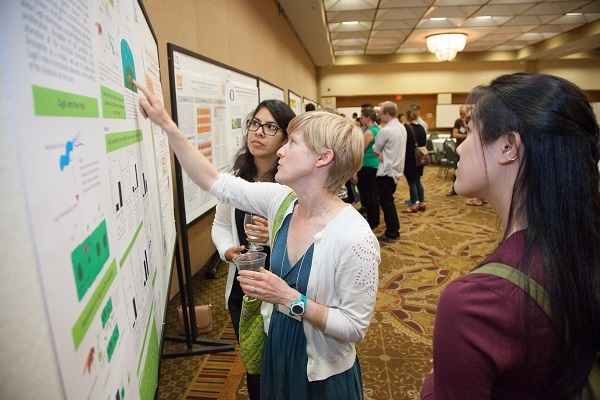 This year’s symposium was the third such hosted by the University of Oregon’s META Center for Systems Biology. Following the intellectual arc of the two previous symposia, which started with modeling host-microbe systems and moved on to synthesis and selection of such systems, the theme for this year’s meeting focused on translating host-microbe models to insights into host health. Speakers highlighted the role of bacterial communities in neurological function and host behavior. Others presented compelling evidence for a microbial role in diseases such as cancer and type 1 diabetes. Work from model organisms such as zebrafish, stickleback, and Drosophila further elucidated the roles that the host, environment, and microbial interactions play in establishing host-associated microbial communities. Tracy Grikscheit, a pediatric surgeon, demonstrated the relevance of such animal models for human diseases in her work on short bowel syndrome in zebrafish (on which she performed short bowel surgery herself!) Another surgeon, Robert Martindale, presented strong evidence for the efficacy of probiotics for post-operative patients to reduce infections and decrease the number of days patients have to stay in the hospital. Overall, the symposium highlighted the need to continue to identify the specific microbial taxa and functions that contribute to the health of their host species. Over the coming years it will be exciting to see how the research conducted at the META center, and by other symposium participants, will be incorporated into standard medical practice.